In early 1967, Robert S. McNamara, U.S. Secretary of Defense, who had been a leading proponent of U.S. involvement in Vietnam, was now frustrated with the stalemate of the Vietnam War. He desired to leave a comprehensive analysis about U.S. involvement in Vietnam for researchers and succeeding administrations so as to prevent future policy errors. On June 17, 1967, the Vietnam Study Task Force – consisting of 36 military personnel, historians, and defense analysts under the direction of John T. McNaughton and then Leslie H. Gelb, was formed and began to prepare the classified study without the knowledge of both President Johnson and Secretary of State Dean Rusk. 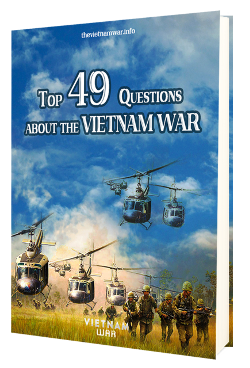 After one and a half year, on January 15, 1969, a 7,000-page report was completed and titled “United States – Vietnam Relations, 1945 – 1967: A Study Prepared by the Department of Defense”, which would be later known as the “Pentagon Papers”. The Pentagon Papers were divided into 47 volumes of approximately 4,000 pages of actual government documents and 3,000 pages of analysis on the policy decisions and internal planning within the U.S. government regarding its involvement in Vietnam from the end of World War II in 1945 to the aftermath of Tet Offensive in May, 1968. Upon completion, the study was classified as “Top Secret – Sensitive”. Only 15 copies were published with limited access. Like most classified documents, the Pentagon Papers could have been buried in the dark but for an unexpected event happened in 1971, it was suddenly revealed to public. The Pentagon Papers was leaked by Daniel Ellsberg, a former United States military analyst, who was invited by Leslie Gelb to work on the study for several months in 1967. By 1969, Ellsberg was frustrated with the deception and escalation of the war by the Nixon administration. With the help of another former RAND employee, Anthony Russo, he began to sneak out and photocopy large sections of the study with the intention of disclosing it to public. Ellsberg then approached some members of Congress such as Senator Fulbright and Senator McGovern, hoping that they would enter the Pentagon Papers into the Congressional Record, but all of them declined. In March 1971, taking advice from Senator McGovern, Ellsberg decided to show the study to Neil Sheehan, a New York Times reporter. 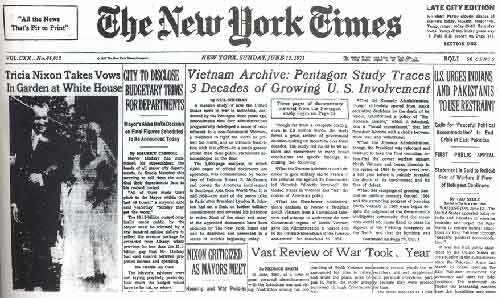 On June 13, 1971, the first article of the series based upon the Pentagon Papers was published by The New York Times. The Pentagon Papers, revealed at the time when the public began raising questions about the Vietnam war, confirmed many people’s suspicions about the “credibility gap” between what the government said and what they actually did. Many shocking information was revealed in the papers, including solid evidence that preceding administrations from Truman to Johnson had knowingly deceived American people in their conduct of the war. For example, the Kennedy administration, who professed shock when Diem regime was overthrown, had played a major role in the November 1963 coup by South Vietnamese generals in which President Diem and his brother Nhu were assassinated and then openly supported a “leaderless” succeeding government. President Johnson decided to send U.S. troops to Vietnam and escalate the war to Laos, even though he had claimed otherwise during his 1964 presidential campaign. As for purpose of the war, while President Johnson claimed that the prime aim of the U.S. in Vietnam was to secure an “independent and non-Communist South Vietnam”, the “Plan of Action for South Vietnam” listed a different set of priorities. According to that action plan, the first priority was to avoid a humiliating U.S. defeat, which took up to 70% of the reasons for the U.S. escalation of the war. 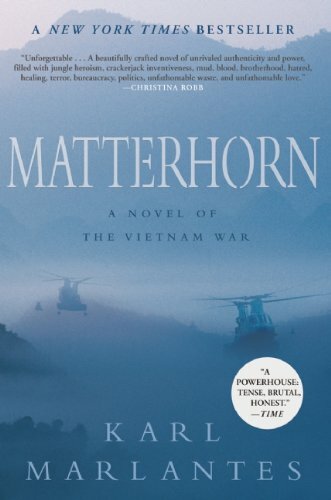 Unfortunately, after the fall of Saigon, Vietnam War was widely considered as America’s most bitter defeat in history. The “moral” purpose of keeping South Vietnam from Chinese hands that the U.S. leaders usually stated turned out to make up only 20%. And only a humble 10% was to help South Vietnamese people enjoy a better and freer way of life. After the first publication, Nixon at first did not worry too much about the papers as it focused more on his predecessors’ errors than him. However, Kissinger thought otherwise and succeeded in convincing Nixon of the threat that the papers could pose to his administration, which could even “destroy American credibility forever”. Right after that, “furious” Nixon demanded an immediate injunction to prevent further publications of the papers. As a matter of fact, both The New York Times and Ellsberg were sued by Nixon administration, but both cases ended up with defeat on the government side. To conclude, the Pentagon Papers not only revealed a considerable amount of hidden facts to the public but also served as an accusation toward the “incredible deceptions” of the U.S. government, who had used the power given by its people to manipulate them. Marked by a landmark battle between The New York Times – one of America’s top newspapers and its government – led by President Nixon which went to the Supreme Court, the study awakened the public, widened the credibility gap between the government and its people and unravelled a saga that led directly to the Watergate, Nixon’s resignation and ultimately the end of the Vietnam War. Bonus Facts: The Pentagon Papers were finally declassified and released on 13 June, 2011. Each volume of the Papers was released as a separate PDF file and available on the National Archives website.